The major markets got a lot more uncomfortable since the last issue, and that's saying something. It's not a bear market on Wall Street but it keeps heading that way. I'm less concerned about continued drawdowns on Wall St than I am about a crash. Crashes take everything down with them while more measured declines–even big ones–allow for some rotation to sectors that look "cheap". The gold sector still has cheap in spades. We may be setting up for another early 2016 scenario where gold stocks–explorers included–hugely outperform other sectors of the market. I'm hoping for that outcome but not counting on it yet. Gold's got to get above $1300 first. And we hope that hedge funds in NY and all those passive retail and index funds don't need to do so much selling in the back half of December to square the books that the wheels come off everything. I don't really expect that, but there may be enough selling to keep the current S&P downtrend going for a while longer. I expect very little news for the remainder of the year. I'm going to start on a yearend issue as soon as this is sent. I'll deal with base metals and other resource sectors in that issue. In the meantime, I wish you all the happiest of holidays for you and your families and for a happy (and profitable) 2019! Dude, where's my Santa Rally? Nowhere to be seen, so far. Ok, technically, Santa rallies come after Christmas, so there is still a chance we get one. It will take one hell of a rally to materially change the market situation pictured in the chart below, though. I'm still not convinced large market and passive index investors will have anything to look forward to in their stockings this year other than lumps of coal. 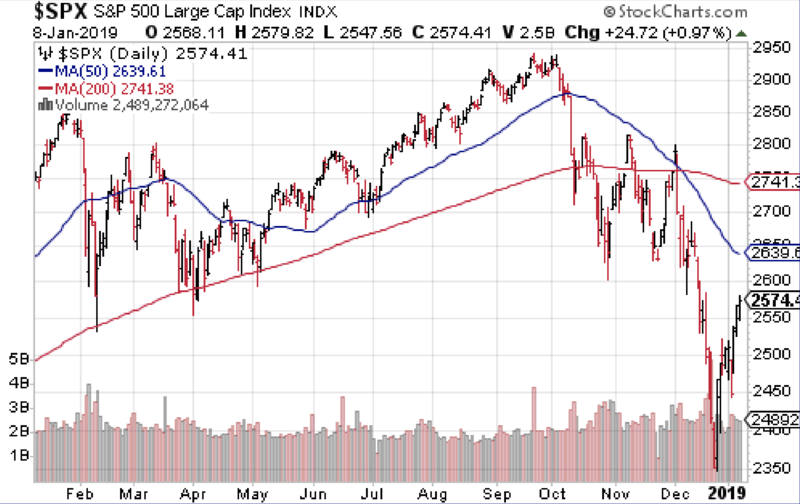 Plenty of bulls are calling for a V shaped bounce, but there isn't an obvious fundamental catalyst for one yet. You can see from the SPX chart below that we have now put in a series of lower highs and lower lows. Even more ominously, the index has now fallen below the February low. NY markets have now joined virtually all other major bourses in being down year to date. It's pretty difficult to put any sort of positive spin on the chart below. The only "good" thing I see at the moment is that sentiment is truly awful in NY. It might be awful enough to generate an oversold bounce. I would not count on a bounce on the S&P being anything other than the "dead cat" variety until something changes for the better on the macro side. Disclaimer: The HRA–Journal and HRA-Special Delivery are independent publications produced and distributed by Stockwork Consulting Ltd, which is committed to providing timely and factual analysis of junior mining, resource, and other venture capital companies. Companies are chosen on the basis of a speculative potential for significant upside gains resulting from asset-based expansion. These are generally high-risk securities, and opinions contained herein are time and market sensitive. No statement or expression of opinion, or any other matter herein, directly or indirectly, is an offer, solicitation or recommendation to buy or sell any securities mentioned. While we believe all sources of information to be factual and reliable we in no way represent or guarantee the accuracy thereof, nor of the statements made herein. We do not receive or request compensation in any form in order to feature companies in these publications. We may, or may not, own securities and/or options to acquire securities of the companies mentioned herein. This document is protected by the copyright laws of Canada and the U.S. and may not be reproduced in any form for other than for personal use without the prior written consent of the publisher. This document may be quoted, in context, provided proper credit is given.